Rashayu (second left) and her daughter are looking forward to their dream holiday abroad. 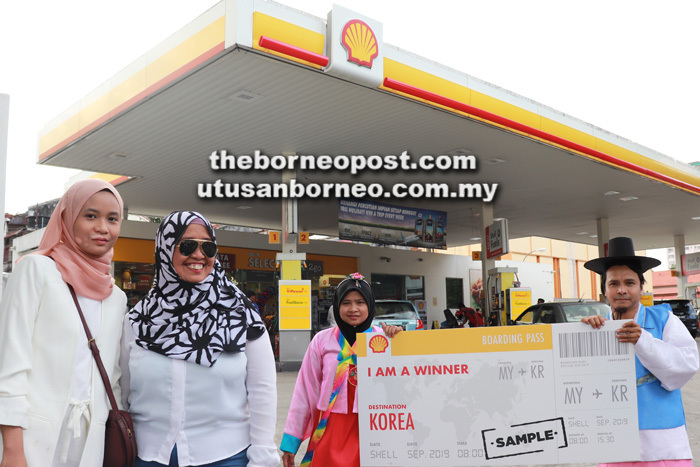 KUALA LUMPUR: A mother of three from Rawang will be going on an all-expense paid holiday to South Korea as the winner for Week 3 of Shell’s ‘Win a Trip’ contest. Rashayu Ahmad, 51, is a regular customer of Shell who stays up-to-date with promotions and contests by Shell but never expected her routine fill-up at the petrol station would lead to a dream holiday. Rashayu and her 18-year-old daughter’s regular stop at Shell have been made memorable as they look forward to their holiday in South Korea together. Rashayu who has been saving up for travel after her children complete their schooling is looking forward to the trip. “I have not travelled with my family before because of the cost. What better way to reward my youngest daughter who just completed her secondary studies,” she said. The mother-daughter duo will be travelling to South Korea for the first time to enjoy an immersive vibrant culture filled with heritage. Shell Malaysia’s ‘Win a Trip with Shell’ contest runs from Dec 17, 2018 until March 31, 2019. One winner is rewarded with a holiday package for two to either Italy, New Zealand or South Korea weekly. Malaysians can participate in the contest with three easy steps: Spend a minimum of RM40 at Shell retail stations nationwide; pick one of the three destinations – Italy, New Zealand or South Korea in the contest form; and submit the form with valid and eligible receipt(s) to stand a chance to win a holiday package for two. Customers can purchase any of the following products: Shell fuels, Shell lubricants, or any products sold within Shell Select and Kedai premises (not including tobacco products, E-Pay products and Touch N Go purchases). For more information on Win a Trip with Shell and the list of weekly winners, visit https://www.shell.com.my/percutianimpian.